Natural gas is seen as a good source for operating many home appliances for a number of economic, operational and environmental reasons: it is low-risk (technically and financially) and lower-carbon relative to other fossil fuels. The City of Hazard offers natural gas service. Just contact City Hall for more information. Do Not turn on any equipment that could cause a spark. Safely abandon any motorized or powered equipment or vehicles. Motorized or electrically powered equipment or vehicles may create an ignition source if a natural gas leak is present. If you do hear sounds of a gas leak, smell natural gas escaping , or observe any other signs, ONLY turn off your gas if it is safe to do so. 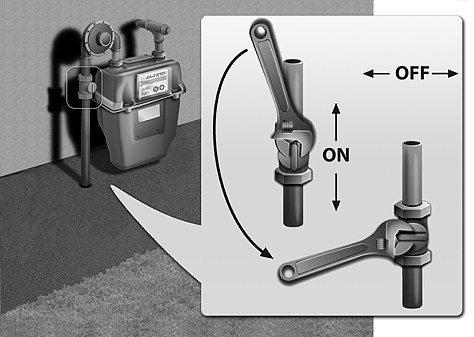 This graphic shows the shutoff valve on the riser pipe from the ground to your meter. An adjustable pipe or crescent wrench can be used to turn the valve a quarter turn in the off position. If you turn the gas off, leave it off, and call City Hall so that the service line can be checked for possible damage before service is restored. This graphic is for informational purposes only. The City of Hazard recommends allowing a trained professional to perform this task. The City of Hazard is a member of Kentucky811; please call before any type of digging is performed so that lines can be located first or visit the Kentucky 811 website. Go to Kentucky811.org for more information.